Besides the 2013 Honda Indy Toronto working as a showcase for IZOD IndyCar drivers James Hinchcliffe and Alex Tagliani to compete for national pride, the historic weekend always involved Canadian drivers in an array of support series. Sometimes its the teenage protégé and other times the line-up contains Canada's finest driver who may not be recognized as household names. Toronto's Mark Wilkins adds his name to the Canadian contingent fighting to win on the popular street circuit. 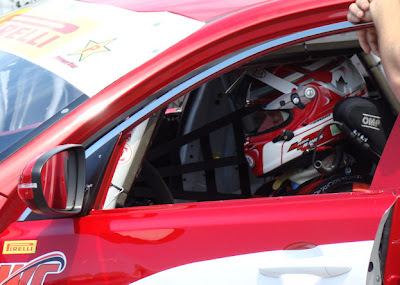 For the 2013 Honda Indy Toronto weekend, he'll be a GTS class force in the wildly diverse and competitive Pirelli World Challenge sports/touring car championship. 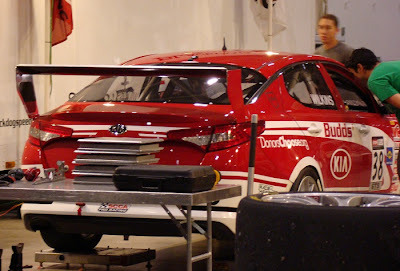 The Canadian's weapon of choice is a Kia Optima Turbo sedan for Kinetic-Kia Racing coincidentally painted red and white. With nine rounds completed in the class so far in the 2013 season heading into the streets of Toronto's Acura Sports Car Challenge, Mark Wilkins resides second in the overall GTS standings. 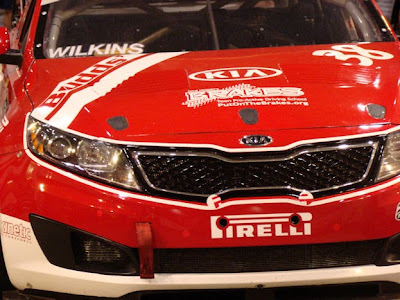 Describing his race car, Wilkins expressed, "The Kia Optima Turbo is a really fun car to race. Given that it is a high horsepower front wheel drive car, it certainly drives a fair bit differently than the open wheel and other sports cars that I have driven." A highlight of this season was a race victory just across the border in Detroit. Contending against V-8 powered machines, Mark Wilkins and his team has been nothing less than impressive heading into the Honda Indy Toronto event. "In the GTS class, we race all sorts of different makes with completely different set ups. With our car, we do the lion share of the work with the front tires where many of our competitors have either front engine rear drive setups or mid engine rear drive setups. We have to manage the front tires on our car where our competitors would be focused on managing the rears. In the end, all of the cars are really closely matched and we have some epic on track battles." said Wilkins driving his first full season with the Kia Optima race car. He joined the Kinetic-Kia Racing team in 2012 at the Leguna Seca round. For over a dozen years, Wilkins has compiled a rich resume of open wheel and sports car racing pursuits. Starting his professional career with the Canadian Formula Ford Championship, he spent five seasons across several Canadian and North American open wheel driving tours including the Star Mazda series (Now called the Pro Mazda Championship). During the 2005 season in Star Mazda, Mark Wilkins was in competition with future superstars James Hinchcliffe, Marco Andretti and Graham Rahal. In fact, with AIM Autosport backing, he was a teammate with the younger Hinchcliffe in the series. "2005 was one of the most challenging years of racing for me. The talent pool in Star Mazda that year was incredible. I certainly learned a lot of race craft from racing with James, Marco and Graham. It was one of those years where you really had to push yourself to find the last tenth every weekend. We certainly had some great battles that year!" A pair of fourth place finishes were highlights to his 2005 season. The time in Star Mazda would come ahead of a transitional period in his career where his racing focus turned to sports car racing. With AIM Autosport's Daytona Prototype effort in the Grand Am Rolex Sports Car Series, Wilkins would be part of two wins in 2008 including an ultra-close victory in Montreal. In 2010, Mark Wilkins paired with the Level 5 Motorsports in the American Le Mans Series Prototype Challenge class in 2010. Wilkins and team won the Mobil 1 Twelve Hours of Sebring and the Leguna Seca event. Two years later, he would add a Petit Le Mans victory to his resume driving for Core Autosport. "I love sports car racing so my heart is certainly in that space.. So many great cars these days." said Mark Wilkins. At this years Rolex 24 at Daytona, he participated with the AIM Autosport team once again to drive a Ferrari 458 Italia. "I never thought I would get the opportunity to race a Ferrari let alone drive the road cars! To finish on the podium at Daytona with Ferrari was an incredible experience." Experiencing good times at Canadian Tire Motorsport Park (Mosport) near to Toronto, Wilkins presence on the street course along Lake Ontario has been limited by the fact he had only raced once at the street course. Having raced on the circuit nine years ago in a North American Formula Renault Championship race, he was taken out while leading. Wilkins is ecstatic about visit to his homeland with the competitive Kia Optima. "I love home races! I spend so much time racing south of the border that when we get the chance to race at home it is just a surreal experience.. I have lots of friends and family coming out to support me which is really nice as well. The fans in Toronto are really enthusiastic so it should really be an electric weekend!" said Wilkins. Racing on Sunday at the Acura Sports Car Challenge race in Toronto, Mark Wilkens is pleased with his GTS class season in the 2013 Pirelli World Challenge championship so far and remains motivated for more . "This has been a great season thus far for Kia Racing in the Pirelli World Challenge. 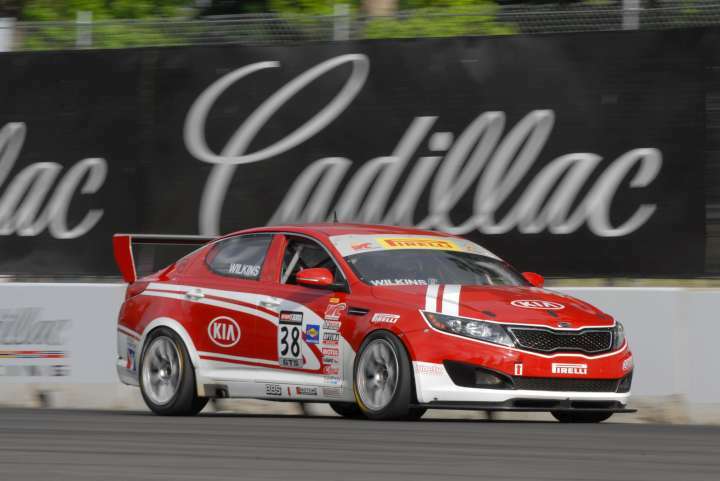 With 4 podiums to date and a win in Detroit, we have certainly showed that the Optima Turbo is a top contender. My goal at the start of the season was to finish every race and focus on a championship run. As we roll into Toronto second in the points and after a solid run of finishes, I'm anxious to keep the momentum going this weekend."